The Defender® Chimney Pot Spike has been designed for seagulls, birds and pigeons causing problems on your chimney cowl or chimney pots by nesting, perching or roosting. Other than noise and unpleasant mess, if seagulls make nests on chimneys it can become a real fire hazard if the chimney is in use. This pigeon and seagull deterrent is a very easy way to keep seagulls off and out of your chimney. 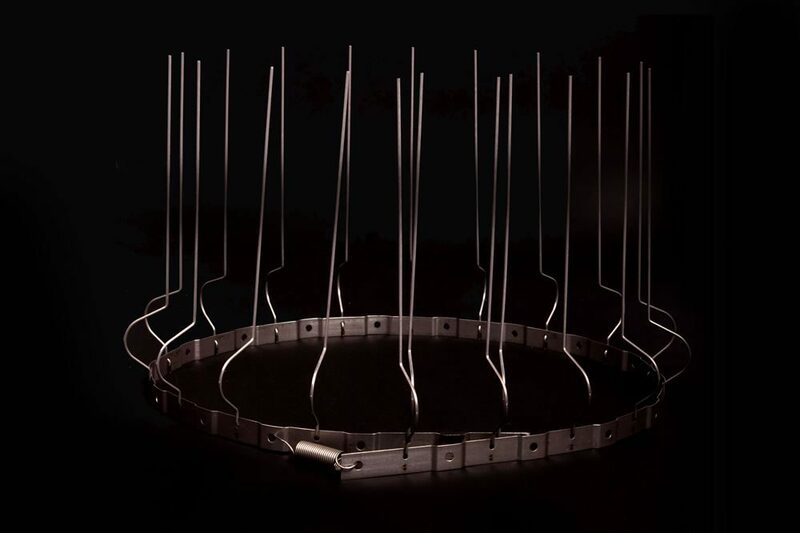 The stainless steel strap is flexible so will fit round or square chimney pots, or around cowls, and will quickly stop seagulls and birds from landing, nesting and causing problems on your roof. The Defender® Cowl Spike has been manufactured with ease in mind. The design of the gull deterrent allows a chimney sweep's brush to thrust straight through the pigeon cowl spikes, this means that the chimney spike does not need to be removed each time the chimney is swept. The brush simply pushes past and retracts easily. Other devices on the market that fit inside the pot are easily knocked out by the force of the chimney sweep's brush. The Defender® Chimney Pot Spikes are made from a stainless steel bendable strap. The chimney cowl spike simply bends to the shape of your chimney pot or chimney pot cowl. Once firmly in place it stops seagulls, pigeons and birds from being able to nest, perch or roost on the chimney pot or cowl. The strap has a spring locking clip and serrated edge, meaning it achieves a strong, tight hold without slippage on any diameter cowl or pot up to 107 cm. This seagull and bird deterrent for chimneys and cowls is a completely humane form of bird control. Although the spikes may seem a little aggressive, the birds will rarely touch them once they have been installed. The spikes act as a gull and pigeon deterrent, stopping the birds from being able to land, on that particular area. Even if they do attempt to land the spikes make it uncomfortable without causing injury, and the birds or seagulls will give up and find an easier roosting site. To ensure your roof top is completely gull and pigeon free, use in conjunction with the Defender® Ridge Spike which is simply siliconed to the top of your roof's ridge tiles. 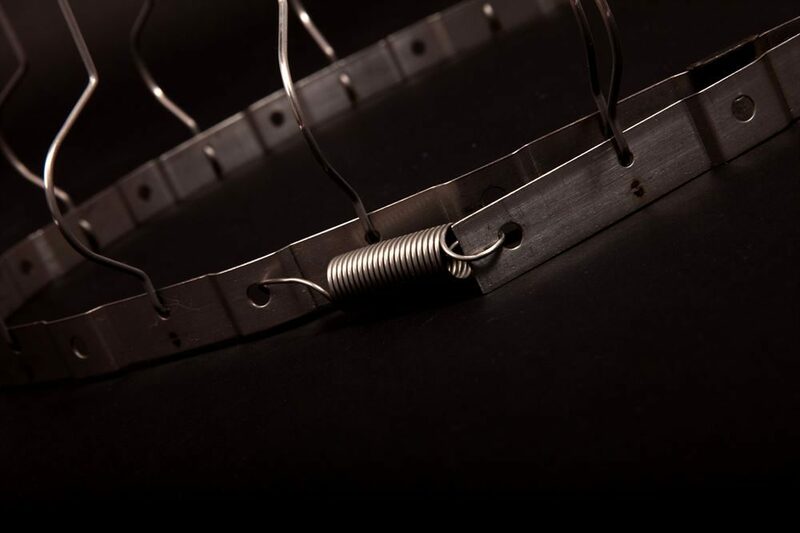 This high quality stainless steel chimney cowl spike strap is made from 304 Grade stainless steel and comes with a 25-Year "No Rust" Warranty. Once installed, the powerful spring locking system will lock this gull deterrent in place, meaning that you can say good bye to your seagull problem on your chimney. David Jones, the owner of Jones and Son, designed and patented this incredibly easy to use seagull deterrent after he experienced his own seagull problem on his property's chimney. Since then, Defender® Chimney Pot Spikes have always been made in the UK, using only the highest quality materials. Jones and Son Pest Control Supplies Ltd prides itself on the manufacturer of quality steel bird spikes, seagull spikes and plastic pigeon spikes that will keep birds off your property's chimneys and roofs. Our Defender® Chimney Pot Spikes have stopped unwanted seagulls, pigeons and other birds from landing and causing problems on the homes of thousands of people. 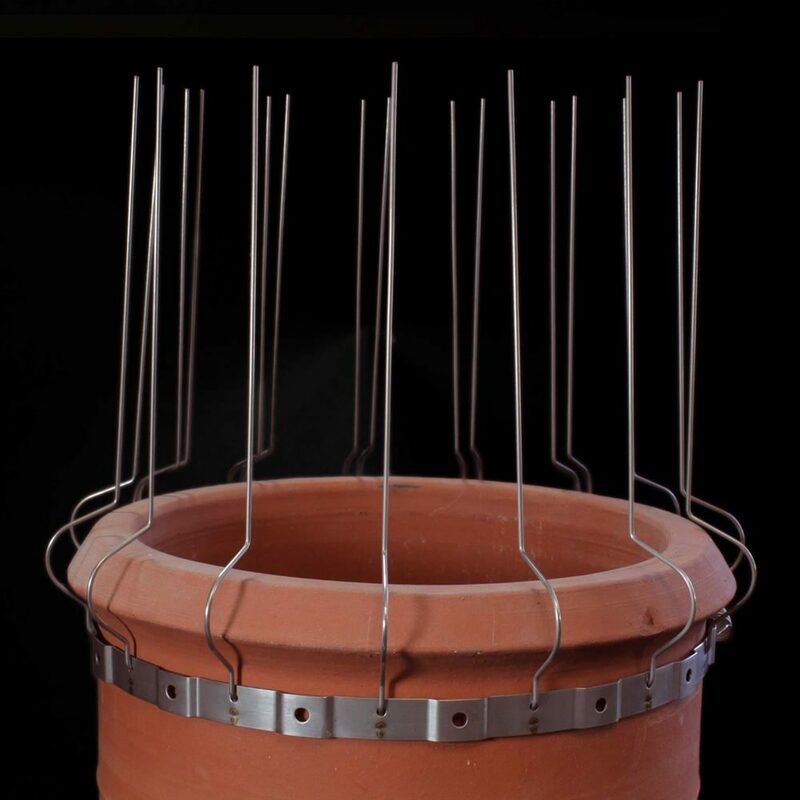 If you need to get rid of birds and seagulls from your chimney pots and chimney cowls and would like to see what other customers think, please look at our reviews: Read Defender® Chimney Pot Spikes Reviews. If you have a "How to get rid of seagulls from my chimney pot cowl" question, please contact us and we will help you rid your roofs of all pigeon and seagull pests. (Mon - Friday 8.30am - 4.00pm).